Set upon spectacular San Diego Bay, the Sheraton San Diego Hotel & Marina, a Four-Diamond hotel, offers tropical luxury in one of the nation’s most beautiful cities. Newly renovated, our landmark hotel is solely known & committed to the needs of our guests, with unmatched service and a waterfront location just one mile from the airport and downtown San Diego. While your here, let us help you relax in one of our three lounges. If you desire spirits and sports, wine, or even martinis, rest assured, we will provide it. For the athletic enthusiast, we offer 3 swimming pools, 2 hot tubs, a complimentary fitness center, volleyball, basketball and tennis courts, as well as a full-service spa for relaxing after an active day. Because you don’t just stay at the Sheraton San Diego Hotel & Marina, you belong. A few months ago, a campus organization I work for held an event at the Sheraton San Diego Hotel and Marina. Overall the experience of planning and executing an event with the Sheraton was amazing. The staff holds extreme attention to detail and it was always very easy to get into contact with our event planner. We dealt with one person while planning this event and it was nice to get that one on one attention without the mess of dealing with a whole bunch of people. A few days before the event, we were told that a bigger room had opened up. This room had a better view of the harbor and would give our party more dancing space. We were upgraded to this room free of change. I thought this was extremely kind of them to do. It required more work on their part due to the planning of the new arrangement of the larger room which I was very thankful for. During the event itself, everything went as planned without a hitch. The five hour long event featured a dinner service and an open bar. We were given two security guards for the event. I arrived at the venue about two hours before everyone else was scheduled to arrive. The room had already been set up. All the table cloths were clean, all the settings were placed and all the details were finished. I really didn't need to worry about much. 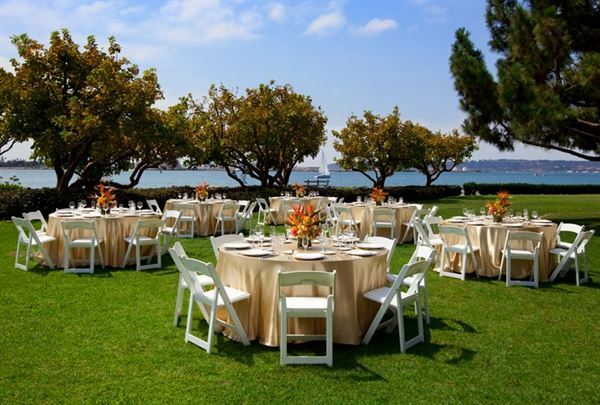 The Sheraton Hotel and Marina in San Diego is a great place to have an event. Plus, the pretty harbor view doesn't hurt.